A monk is a man that’s part of a brotherhood, living in a monastery, and devoted to a discipline prescribed by his order. What most people don’t realize is that Trappist monks are accomplished brew masters. So while most of us thought monks chanted all day, the folks at The Lucky Monk drew inspiration from these age old brew masters to craft their own line of specialty beers. Since man cannot live on beer alone (some of you have tried), a full menu is available to help lead you to a path of enlightenment. Glance over the drink menu and you’ll notice that a whopping thirty five beers are available and seven are brewed in house. Two standouts are the “Cardinal Sin”, a Czech-style pilsner and the “Pale Belgian”. In order to drink more beer you need to eat. I’m sure you’ve learned your lesson about drinking on an empty stomach! For those feeling a little Mediterranean, a creamy serving of hummus is available. While I do prefer warm/soft pita bread, the toasted pita will appeal to the potato chip fan. 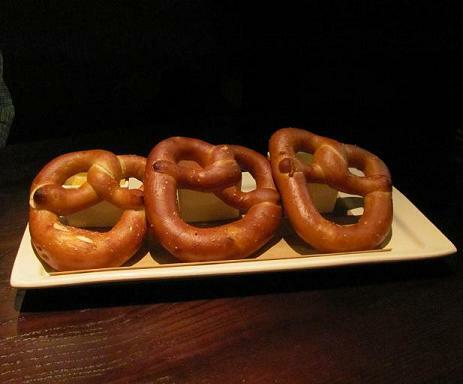 A true delight was the warm pretzel trio. Three warm pretzels served with honey mustard butter, tomato parmesan sauce, and the oh so heavenly Wisconsin cheddar beer fondue. The fondue is so good, you could serve it on a shoe and it would be delicious! How about some fries? 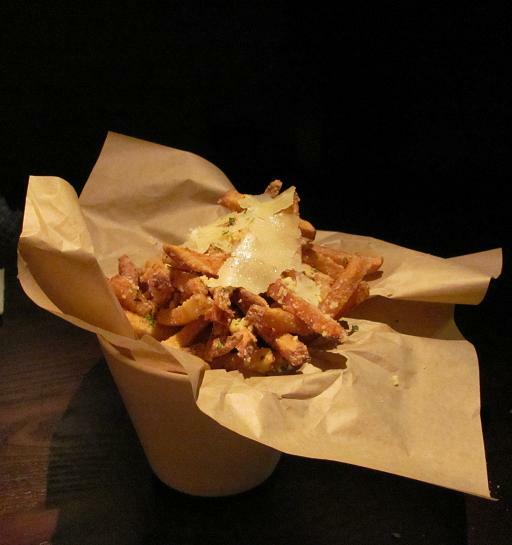 How about some white truffle-parmesan fries? For a $1.50 more, you get fries drizzled in white truffle oil, sprinkled with sea salt, and topped with shaved parmesan cheese, YUM! You don’t need to be on the path to enlightenment to know that most guys eat pizza and burgers with their beer. Seven prime beef burgers are available here, with both a 6oz and a manly 9oz size available. Tonight’s choice was the 9oz smothered burger. Cooked nicely to medium, this juicy burger is toped with sweet caramelized onions, creamy Gruyere, lettuce, tomato, and sits on a sturdy sesame seed bun. While I am admittedly a deep dish fan, I do on occasion enjoy some thin crust pizza as well. New York style thin crust is featured here and it works on most levels. The crust is crisp and chewy, the cheese is flavorful and stretchable, the sausage is meaty and plentiful, but the sauce is ordinary and forgettable. The pizza is still a good choice, just not the standout that the burger was. Dessert should never be skipped! If you’re already eating burgers and drinking beer, your thoughts about your diet should be thrown out the window. 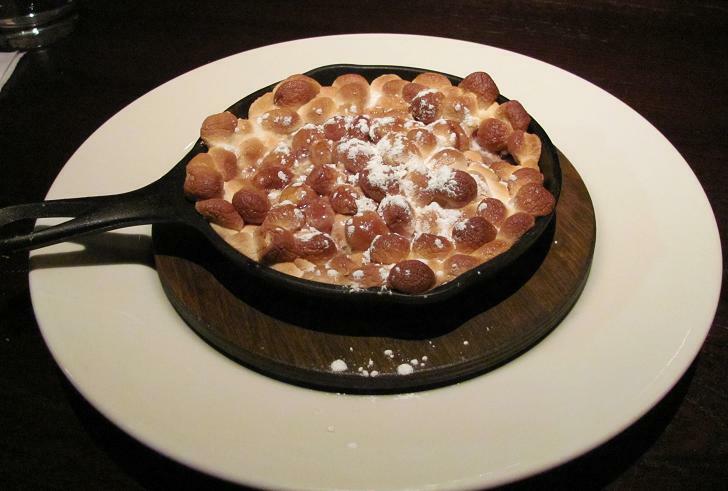 Think back to your childhood in the boys/girls scouts and dig into the hot skillet s’mores. Warm melted chocolate and toasted mini marshmallows make this a rich and decadent dessert. The star dessert is the house made apple strudel. Thin sliced apples kissed with cinnamon and wrapped in filo dough make this a dessert good enough to kiss the chef over!